Angela began her career as a social worker for non-profit organizations in 1991 after obtaining her Master's Degree in Social Work at UW-Milwaukee. She worked with children ages Birth to Five and their families, including two years at Head Start. She was hired as a School Social Worker by the School District of Janesville in 1998. 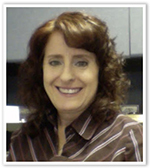 In 2011, she received her Master's Degree in Educational Leadership from Cardinal Stritch University. She additionally completed coursework to obtain licensure for Director of Pupil Services & Special Education in 2013.